Another day, another idiot minister. On Tuesday it was the turn of Peter Dutton, the immigration minister in charge of torturing children, women and men on Nauru and Manus Island.​ Former Assistant Commissioner of Taxation John Passant reports. AS AN aside, do Ministers have a competition going to see who can stuff things up the best each day? After the border farce that was “operation fortitude”, I would have thought Dutton was the Brownlow medal favourite for the year. There was no need for him to go for a second attempt. But he did. 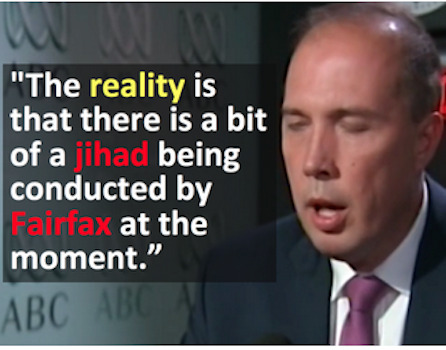 Maybe that is why Dutton is upset. The ABC and Fairfax have exposed the secretly desired future industrial relations agenda of the Abbott government, something that free trade agreements are now attempting by subterfuge to introduce. If you want real evidence of a media jihad aimed at bringing down a government, then the Murdoch Empire’s attacks on the former Gillard and Rudd Labor governments are a pretty good example. Here are some of the front pages from Murdoch’s rags. When Labor complained about these attacks, the response of Abbott, the then Opposition leader, was classic. Yes, that seems too to be true of this incompetent, authoritarian and thoroughly anti-worker Abbott government. The problem is that “good government” in the age of global recession and falling profit rates requires capitalist governments to be “bad”, i.e. to attack workers and their jobs, wages and conditions, to cut public services and to undermine unions as the last bastion able to resist governments of austerity and reaction. The basic social democratic wishes of workers for a better world, born of the iron law of capitalism that to survive workers have to sell their ability to work conflict with the needs of capital for less and less social democratic spending and the return of that surplus value not to the working class via the state but to capital itself. Some of the anger against Labor and now the Liberals was driven by changes in the economy and the threat this poses to both the middle classes and the working class. Some of it is driven by cuts to public health, public education, public transport and other public goods and support. Some of it too is a reaction against incompetence. Tony Abbott is giving Billy McMahon a run for his money. All of this means that even if Fairfax and the ABC were running a jihad against the Abbott government, if the Abbott government were actually reducing unemployment, improving public services, and seeing real living standards improve, it wouldn’t influence voters. They’d still vote for a good government. Of course they aren’t reducing unemployment, improving public services, and helping real living standards improve. The crisis of global capitalism, now working its way through the Chinese and Australian economies, means we are doomed to have a cycle of bad governments. In other countries, this has seen a turn to alternative political expression of anti-austerity politics, sometimes built on or at least coming out of social struggles. SYRZA in Greece, Podemos in Spain, the seemingly inexorable rise of Jeremy Corbyn to the leadership of the British Labour Party, the strong position of Sinn Fein in Ireland, the support Bernie Sanders is getting in the U.S., are a few examples of this social democratic desire coming out. Blair accuses Corbyn of having weapons of mass Democracy & asks 4 an all out strike by his right wing attack dogs to avert social harmony! There is no indication that any such outbreak will occur in Australia through the current major political currents, especially not through the ALP. Labor in Australia is in what some British might call the death grip of Blairism. It might occur through mass struggles, but again none at this stage look like breaking out. The union movement, for example, continues to capitulate to the bosses over most attacks and is responding not with industrial action but once again with a tepid vote Labor campaign. Until an anti-austerity mass movement and its political expression arise, we will continue to have bad government after bad government in Australia. That new formation will I suspect only happen when we decide to take action as the working class against whoever is in power, the Liberals or Labor.